Shoshone National Forest is the first federally protected National Forest in the United States and covers nearly 2.5 million acres in the state of Wyoming. Originally a part of the Yellowstone Timberland Reserve, the forest was created by an act of Congress and signed into law by U.S. President Benjamin Harrison in 1891. There are four wilderness areas within the forest, protecting more than half of the managed land area from development. From sagebrush plains through dense spruce and fir forest to craggy mountain peaks, Shoshone National Forest has a rich biodiversity rarely matched in any protected area. Three major mountain ranges are partially in the forest: the Absaroka, the Beartooth and the Wind River Range. Yellowstone National Park forms part of the boundary to the west; south of Yellowstone, the Continental Divide separates the forest from its neighbor, the Bridger-Teton National Forest, to the west. The eastern boundary includes privately owned property, lands managed by the U.S. Bureau of Land Management and the Wind River Indian Reservation, which belongs to the Shoshone and Arapahoe Indians. Custer National Forest along the Montana border is the boundary to the north. The Oregon Trail, the 19th-century covered wagon route, passes just south of the forest, where broad and gentle South Pass allowed the migrants to bypass the rugged mountains of the forest. All of the forest is a part of the Greater Yellowstone Ecosystem, an unbroken expanse of federally protected lands encompassing an estimated 20 million acres. 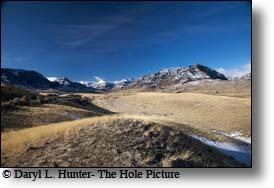 Shoshone National Forest is named after the Shoshone Indians, who, along with other Native American groups such as the Lakota, Crow and Northern Cheyenne, were the major tribes encountered by the first white explorers into the region. Archeological evidence suggests that the presence of Indian tribes in the area extends back at least 8,000 years. The forest provided an abundance of game meat, wood products, and shelter during the winter months from the more exposed high plains to the east. The Shoshone and Sioux frequented portions of the more mountainous regions for spiritual healing and vision quests. By 1840, Chief Washakie had become the leader of the easternmost branch of the Shoshone Indians. In 1868 he negotiated with the U.S. Government for 2.2 million acres to be preserved as tribal lands, known today as the Wind River Indian Reservation. 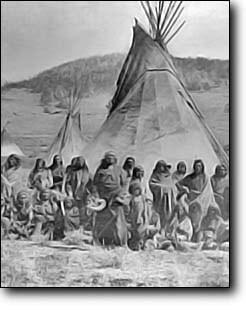 Prior to the establishment of the reservation, the U.S. Cavalry constructed Fort Brown on the reservation lands, which was subsequently renamed Fort Washakie. During the late 1800s, African-American members of the U.S. Cavalry, better known as the Buffalo Soldiers, staffed the fort. Chief Washakie is buried at the fort, which is located immediately east of the forest boundary. Rumor has it that Sacajawea, the Shoshone Indian who provided invaluable assistance to Meriwether Lewis and William Clark during the Lewis and Clark Expedition, is also buried here, but it is now considered that this is unlikely and that her actual burial place is much farther east. In the early 1800s, mountain men and explorers such as John Colter and Jim Bridger visited the forest. Colter is the first white man known to have visited both the Yellowstone region and the forest, which he did between the years 1806 and 1808. Having been an original member of the Lewis and Clark Expedition, Colter requested permission from Meriwether Lewis to leave the expedition after it had finished crossing the Rocky Mountains during their return journey from the Pacific Ocean. Colter teamed up with two unaffiliated explorers the expedition had encountered, but soon thereafter decided to explore regions south of where his new partners wished to venture. Traveling first into the northeastern region of what is today Yellowstone National Park, Colter then explored the Absaroka Mountains, crossing over Togwotee Pass and entering the valley known today as Jackson Hole. 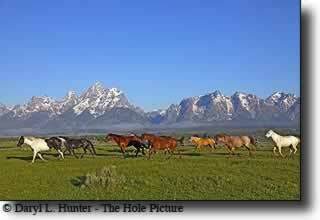 Colter survived both a grizzly bear attack and a pursuit by a band of Blackfeet Indians that had taken his horse. The explorer later provided William Clark, who had been his commander on the Lewis and Clark Expedition, with previously unknown information on the regions he had explored, which Clark published in 1814. Travels by fur trappers and adventurers, such as Manuel Lisa and Jim Bridger from 1807 to 1840, completed the exploration of the region. With the decline of the fur trade in the late 1840s and much of the prized beaver long since made scarce by over-trapping, few white explorers entered the forest over the next few decades. Explorations under direction of F.V. Hayden in 1871 were the first federally financed and supported. Hayden was primarily interested in documenting the Yellowstone country west of the forest, but his expedition also established that the forest was a prime resource that merited protection. Travels in the forest in the 1880s by later U.S. President Theodore Roosevelt, who was also a strong advocate of land conservation, provided the impetus that subsequently established the Yellowstone Timberland Reserve in 1891, creating the first national forest in the U.S. In 1902 President Roosevelt first greatly expanded the reserve and then divided the reserve into four separate units, with Shoshone being the largest. Upon the creation of the U.S. Forest Service in 1905, the reserve was designated a National Forest, but the current wording and title were formulated forty years later in 1945. A remnant of the earliest years of the forest management is the Wapiti Ranger Station which is located west of Cody, Wyoming. The station was built in 1903 and is the oldest surviving ranger station in any national forest, and is now listed on the National Register of Historic Places. During the last decade of the 19th century, minerals such as gold were mined with limited success. The last mine was abandoned in 1907, but panning for gold is still allowed in many areas of the forest, and in most circumstances no permit is required. After the end of the mining era, numerous camps were established by the Civilian Conservation Corps to help combat unemployment during the Great Depression of the 1930s. 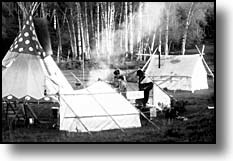 The camps housed groups of unemployed men who were paid by the federal government to build roads, hiking trails, and campgrounds for future travelers to the Yellowstone region. Visitation increased after the end of World War II with the advent of better roads and accessibility to the region. The U.S. Forest Service, an agency within the U.S. Department of Agriculture, manages Shoshone National Forest. The forest is separated into five districts and has a staff of 145 employees. The annual operating budget is $15,000,000, with much of it from grants. 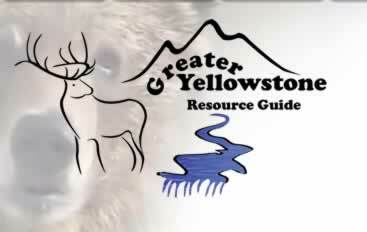 The headquarters and a visitor center are in Cody, Wyoming and a smaller information center is in Lander, Wyoming. 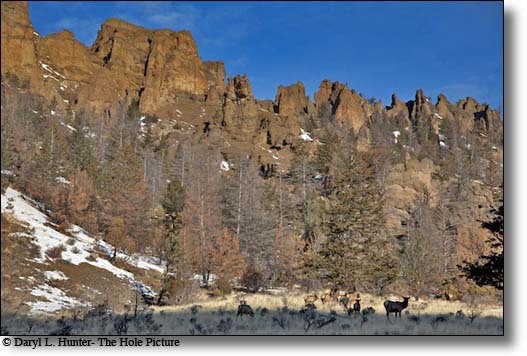 As is true with all National Forests in the U.S., Shoshone National Forest practices conservation of resources, which ensures a sustainable flow of some raw materials from the forest, such as lumber for construction purposes and wood pulp for paper products. 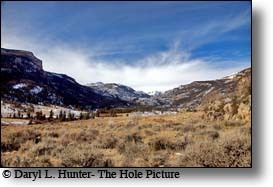 Additionally, mineral extraction through mining and oil and gas exploration and recovery are also conducted, though in Shoshone National Forest this has become less common due to a consensus to protect the natural surroundings. More common than logging and mining are the lease options that are offered to ranchers to allow them to graze cattle and sheep. The forest provides guidelines and enforces environmental regulations to ensure that resources are not overexploited and that necessary commodities are available for future generations. The efforts of environmentalists combined with public demand led to the creation of wilderness designated zones beginning in 1964 within most U.S. Government land areas that fit the criteria of wilderness. The wilderness designation provides a much higher level of land protection and prohibits any alterations by man to the resource. In Shoshone National Forest, less than ten percent of the total area is utilized for land lease, logging or mineral extraction. The rest of the forest is either designated wilderness, reserved for habitat protection for plants and animals, or set aside for visitor recreation. However, the overgrazing of cattle in riparian areas and into zones not within lease agreements are continuous points of argument. Oil and gas exploration interest groups also lobby to explore regions that may adversely impact wildlife habitat. Plans to build roads into non-wilderness areas for easier extraction of timber have come under fire and are not in compliance with recent legislation that prohibits such construction. Illegal off-road motorized transport by all-terrain vehicles and snowmobiles continues to be a problem, especially in wilderness areas. Lastly, protection of threatened and endangered species such as the grizzly and wolf is sometimes met with opposition from local ranching interests. Shoshone National Forest has about 1,300 documented species of plants. Lower elevations often have sagebrush and grass-dominated vegetation types, while various combinations of species dominate forested areas. These include lodgepole pine, which along with Rocky Mountain juniper, douglas fir and quaking aspen are found at elevations up to 9,000 feet (2,700 m). At higher elevation sub-alpine fir, Engelmann spruce, whitebark pine and limber pine, are common, each occurring up to timberline. Along lower elevation riparian corridors, cottonwoods and willows are typically dominant. Numerous plant species are endemic to the region. Among them, the whitlow grass, fremont bladderpod, shoshonea, and the north fork easter daisy provide vivid white and yellow flowers during the spring and summer. Exotic species are usually introduced accidentally into the forest from vehicles, traveling many miles from their native habitat. In most cases, these exotic plant species are found near roadways and campgrounds. The mountain pine beetle is a naturally occurring insect species that is known to infest forest groves, and is particularly common in areas with numerous lodgepole pines and fir trees. During strong infestations, the beetle can wipe out huge areas of forest, increasing wildfire potential and reducing habitat and the sustainability of the forest. 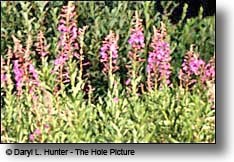 The Forest Service has an invasive species control effort that identifies and attempts to contain the further spread of non-native plants. 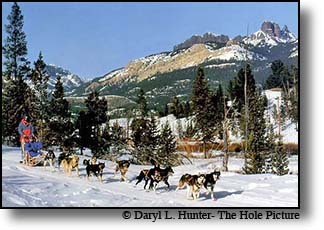 Since the migration of the endangered grey wolf into Shoshone National Forest after the successful Wolf Reintroduction Program in the Yellowstone region commenced in the late 1990s, virtually all of the known 50 mammal species that existed prior to white settlement still exist. An estimated 125 grizzly bears roam between the forest, Yellowstone National Park and the two other National Forests that border the Shoshone. The U.S. Fish and Wildlife Service in the lower 48 states list the grizzly as a threatened species, and the forest is one of their last strongholds. For what are considered to be "problem bears", non-lethal traps are set to capture them so that they can be relocated to remote areas, away from civilization. In the case of the grizzly, each captured bear is tranquilized and then ear tagged with an identifying number. Each number is registered, and if the bear continues to return to areas where they pose a risk of imminent threat to human safety, they are exterminated. The grizzly recovery efforts implemented by federal agencies have often been the subject of major disagreements with local landowners and surrounding municipalities. This situation occurs less frequently with the smaller and less aggressive black bear, of which an estimated 500 reside in the forest. An active management program, in conjunction with other National Forests and National Parks within the Greater Yellowstone Ecosystem, works cooperatively to maximize human safety and to ensure habitat protection for both species of endemic bears. Visitors are mandated to store their food in their vehicles or in steel containers found in campgrounds, and bear-proof trash receptacles are located in the front-country zones throughout the forest. In the backcountry, food must be stored some distance from campsites, and other related precautions are enforced to help prevent bad encounters. The mountain lion (also known as the puma or cougar) and the gray wolf are the major carnivores that inhabit the forest. The nocturnal mountain lion is rarely seen and their numbers are not known, but evidence such as numerous paw prints suggests they are widespread. The wolf has migrated into the forest from Yellowstone National Park but is less common in the forest. The population of wolves is hoped to increase over time for this endangered species. Other omnivorous mammals in the forest include the wolverine, coyote, bobcat, weasel, marten and ferret. Additionally, the beaver, marmot, pika, raccoon and badger are commonly found throughout the forest. 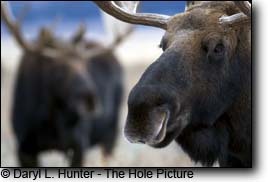 Native herbivores such as the moose are found in small numbers near waterways, especially at lower elevations. Elk (also known as wapiti), mule deer and pronghorn (also called pronghorn antelope) are some of the most commonly seen mammals and there are some small populations of bison. Bighorn sheep and mountain goats inhabit the rocky terrain and highest elevations. 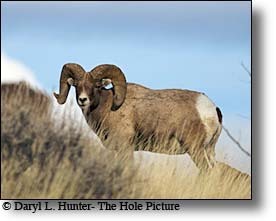 During the winter, the largest bighorn sheep herd in the lower 48 states congregate in the region around Dubois, Wyoming; however, their numbers since 1990 have been greatly diminished due to disease and coyote predation. An estimated 300 species of birds are found in the forest at least part of the year. 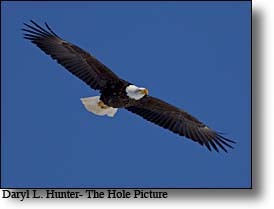 Bald Eagle and golden eagle are more common now than they have been for decades and tend to inhabit areas near waterways. Peregrine falcon, merlin, hawks and the great horned owl are other birds of prey that have become more widespread. The gregarious black-billed magpie and Clark's nutcracker (in the crow family) frequent areas near campgrounds and lakes. The trumpeter swan is found in very limited numbers, primarily in or near lakes and streams. Other waterfowl such as the great blue heron, white pelican, Canada goose and numerous species of ducks are also seen. pheasant, sage grouse and wild turkey are widely distributed across the open sage lands. There are eight species and subspecies of trout present in streams in the Forest, with the cutthroat trout being the only species native to Wyoming. The Yellowstone cutthroat trout is found only in the forest and adjacent parks and is one of four subspecies of cutthroat trout in the forest. Additional game fish species include arctic grayling, mountain whitefish and the shovelnose sturgeon. There are few reptiles in the forest; however, several snake species including the venomous prairie rattlesnake can be found at lower elevations along with other reptiles such as the western painted turtle and the ornate box turtle. Amphibians such as the Columbia spotted frog, tiger salamander and the boreal toad are relatively common. Insects such as mosquitoes and black flies can be pesky in the spring and summer and at the highest altitudes are known to be very bothersome. The forest contains four areas of pristine wilderness that have remained largely untouched by human activities such as mining, logging, and road and building construction. The four regions comprise 1.5 million acres and include the North Absaroka, Washakie, Fitzpatrick and Popo Agie Wildernesses. Additionally, a small portion of the Absaroka-Beartooth Wilderness extends into the extreme northwestern part of the forest, along the Montana border. The Wilderness Act of 1964 enhanced the protection status of remote and/or undeveloped land already contained within federally administered protected areas. Passage of the act ensured that no human improvements would take place aside from those already existing. The protected status in wilderness designated zones prohibits road and building construction, oil and mineral exploration or extraction, and logging, and also prohibits the use of motorized equipment, including even bicycles. The only manner in which people can enter wilderness areas is either on foot or horseback. Hunting and fishing are permitted in the wilderness; just as they are throughout the forest, provided those engaging in such activities have the proper licenses and permits. 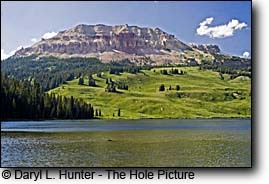 The altitude in the forest ranges from 4,600 feet near Cody, Wyoming, to 13,804 feet at the top of Gannett Peak, an elevation gain of over 9,200 feet. Of the three major mountain ranges found in the forest, they are geologically distinct from each other. All of the mountains are a part of the Rockies and are at the transitional point between the central Rockies and the northern Rockies. The Absaroka Mountains were named after the Crow Indian tribe, although they only inhabited the far northernmost part to the mountain range. The majority of the Absaroka Mountains are contained within the forest, with the highest peak being Francs Peak at 13,153 feet Stretching north to south through the northern and eastern sections of the forest, they span over 100 miles from the Montana border to south of Dubois, Wyoming. The peaks of the Absaroka are basaltic in origin, having been the result of volcanic activity estimated to have occurred 50 million years ago during the Eocene epoch. The rocks themselves are relatively dark and consist of rhyolite, andesite and breccias. Because of the erosional influences of glaciers and water and the relative softness of the rocks, the Absarokas are quite craggy in appearance. Gold was mined from the slopes of Francs Peak until 1907, and the small ghost town of Kirwin is still visited. Few lakes exist in the Absarokas, but the headwaters of both the Bighorn and Yellowstone Rivers are found there. The Beartooth Mountains in the northernmost section of the forest are intrusive igneous and metamorphic in origin, and at 3.96 billion years old, some of these exposed Precambrian rocks are among the oldest found on the Earth. Although often considered a part of the Absarokas, they are distinct in appearance and geologic history. Uplifted approximately 70 million years ago during the Laramide orogeny, the Beartooths consist of vast windswept plateaus and rugged peaks with sometimes sheer cliff faces. The granite, gneiss and schist rocks are rich in minerals such as chromium and platinum. Iron and magnesium are found in the biotite, amphiboles and pyroxene minerals throughout the range. Quartz and feldspars are also commonly found. 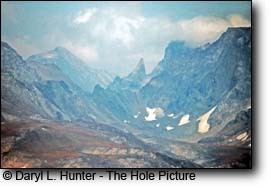 Geologists believe that the Beartooths were at one time at least 20,000 feet (6,100 m) in altitude, but subsequent erosion for tens of millions of years has reduced them to an average of 12,000 feet for the higher peaks. There are an estimated 300 lakes in the Beartooth region of Shoshone National Forest, some of them left behind by the receding glaciers of the last glacial maximum known as the Pinedale Glaciation, which ended roughly 10,000 years ago. The Beartooth Highway (U.S. Highway 212) crosses 10,974-foot Beartooth Pass, and from there descends to the northeast entrance to Yellowstone National Park. The Wind River Range is in the southern portion of the forest and is composed primarily of granite rock, gneiss and schist. Gannett Peak is the highest peak in Wyoming, and another seven peaks also exceed 13,500 feet At one time, Fremont Peak was thought to be the tallest mountain in the Rocky Mountains due to its prominence when viewed from the Oregon Trail. Over 230 mountains rise above 12,000 feet This range is also popular with mountain climbers from all over the world because of its solid rock and variety of routes. The Cirque of the Towers in the Popo Agie Wilderness is one of the more popular climbing and hiking destinations, and an estimated 200 different climbing routes are located within the peaks that surround the cirque. 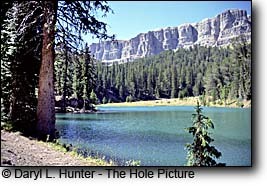 Hundreds of lakes are located in this region as are the headwaters of the Wind River. There are over 500 lakes in the forest, and 2,500 miles of streams and rivers. The Clarks Fork of the Yellowstone River is designated as a National Wild and Scenic River for 22 miles (35 km) through the forest, with cliffs towering up to 2,000 feet as the river winds through a gorge. The forest is on the eastern slopes of the Continental Divide, and the rivers flow into the Atlantic Ocean basin. 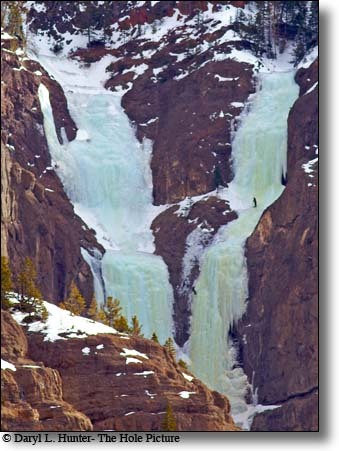 According to the U.S. Forest Service, Shoshone National Forest has the greatest number of individual glaciers of any National Forest in the Rocky Mountains. 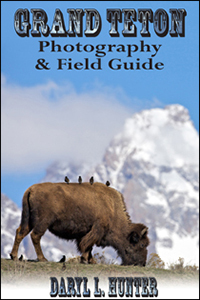 The forest recreation guide lists 16 named and 140 unnamed glaciers within the forest, all in the Wind River Range. Forty-four of these glaciers are in the Fitzpatrick Wilderness, centered around the highest mountain peaks. However, the state water board for Wyoming lists only 63 glaciers for the entire Wind River Range, and this includes areas outside the forest boundaries. While there is little doubt that the forest has more glaciers than any other in the Rockies, there is no controversy that all of the glaciers in the forest are retreating rapidly. Reversing the growth that occurred during the Little Ice Age (1350–1850), there has been a reduction of mountain glacial ice worldwide of 50% since 1850. Much of this reduction has been well documented by photographic evidence and other data. An increase in recession rate since the 1970s, however, seems to be correlated with anthropogenic global warming. The behavior of the glaciers of Shoshone National Forest is consistent with this pattern. The area covered by glaciers shrank by 50% in the century after they were first photographed in the late 1890s. Research between 1950 and 1999 demonstrated that the glaciers shrank by over a third in that period. Research also indicates that the glacial retreat was proportionately greater in the 1990s than in any other decade of the last 100 years. Gannett Glacier, on the northeast slope of Gannett Peak, is the largest single glacier in the U.S. Rocky Mountains. It has reportedly lost over 50% of its volume since 1920 with 25% of that loss since 1980. Fremont Glacier has been studied more than any other in the Wind River Range. Scientist have obtained ice cores from the Fremont Glacier and found that there have been measurable changes in the atmosphere over the past 500 years. The small glaciers in the forest are less able to resist melting than the great ice sheets of Greenland and Antarctica. Once a glacier begins retreating, it may fall into disequilibrium and be unable to find mass balance (accumulation versus melting rate) at any size. Without a favorable climate change, it will continue to retreat until it disappears. Glaciologists predict that if current trends continue, the remaining glaciers in the forest will disappear by 2020. Shrinkage already reduces the summer glacial runoff that supplies water to streams and lakes and provides a cold-water source vital to certain fish and plant species. This, in turn, may have a significant impact on the forest ecosystem over time. With an average of less than 10 inches (25 cm) of precipitation annually, Wyoming is generally considered an arid state. 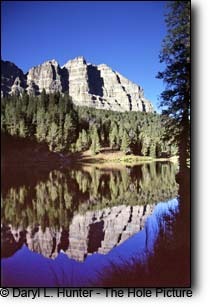 However, Shoshone National Forest is located in some of the largest mountain ranges in the state, which ensure that glaciers and snowmelt provide water for streams through the dry summer months The average temperature at the lower elevations is 72 °F during the summer and 20 °F (−6.7 °C) during the winter, and the higher peaks average 20 °F less than those figures. Most of the precipitation falls in the winter and early spring, while summer is punctuated with widely scattered afternoon and evening thunderstorms. The fall is usually cool and dry. Due to the altitude and dryness of the atmosphere, vigorous radiative cooling occurs throughout the year, and temperature variances of 50 °F daily is not uncommon. Consequently, the nights range from very cool in the summer to extremely cold in the winter; therefore, visitors should always remember to bring along at least a jacket, even during the summer. Shoshone National Forest receives an average of over half a million visitors a year. Two visitor centers provide orientation, books, maps, and interpretive displays and are staffed by either forest service interpreters or volunteers. 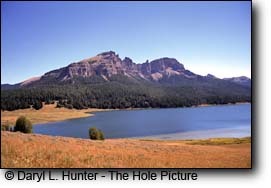 The Wapiti Wayside is on the Buffalo Bill Cody Scenic Byway, west of Cody, Wyoming adjacent to the historic Wapiti Ranger Station; another visitor center is to the south in Lander, Wyoming. There are 30 vehicle access campgrounds in the forest, with up to 27 individual sites each. Approximately half of these campgrounds provide running water and restroom facilities and also provide for handicapped accessibility. Referred to as "front country" campgrounds, they also permit recreational vehicle access in most cases. All of the campgrounds are on a first come, first served basis except for the Rex Hale campground, which is on the National Recreation Reservation Service; a phone and web-based system that permits campsite reservation months ahead of time. Due to the presence of grizzly bears, some of the campgrounds require what is referred to as "hard-sided" camping only, and tent camping is not permitted. For some visitors the greater solitude of the "backcountry" requires accessing hiking trails and then backpacking or horseback riding into more remote destinations. There are dozens of trails, which total over 1,500 miles spread throughout the forest. The Continental Divide Trail weaves its way through the forest, though it follows alternatively named trails for some of the distance. There is also the Nez Perce National Historic Trail and the Beartooth Loop National Recreation Trail, both of which are in the northern regions of the forest. Some remote areas can be accessed by horseback. Trailheads usually provide enough room for horse and pack animal trailers plus personal vehicles. Along forest access roads, all-terrain vehicles are allowed, however there are plans to limit their use in most of the forest. Hunting and fishing are popular recreational activities permitted throughout the forest, provided that proper permits are obtained and the applicable rules and regulations are followed. Hunting regulations are altered each year to ensure certain species are protected from over hunting and to maximize personal safety. Many of the streams and rivers are considered to be "Blue Ribbon Trout Streams". 1,700 miles of streams and 500 lakes that can be legally fished from, provide plenty of elbow room during even the most crowded of fishing seasons. 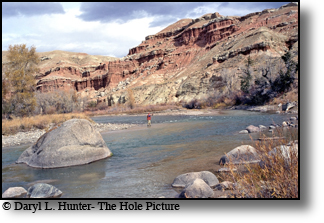 Hunting and fishing licenses are sponsored by the state of Wyoming and are available through the state department of fish and game. The southern section of the forest in the Wind River Range is the primary destination for mountain climbers. Twenty-nine of the highest 30 peaks in Wyoming are here, and the mountains are primarily of granite rock with countless cliffs and sheer rock walls. 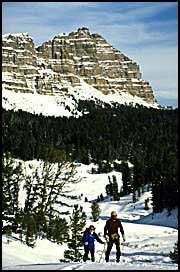 The Cirque of the Towers is particularly popular as it has numerous peaks within a relatively short distance of each other. Winter activities include cross-country skiing and snowmobiling. 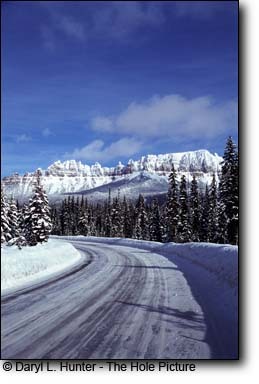 The Continental Divide Snowmobile Trail is a popular maintained snowmobile route that can be accessed from Togwotee Pass. With up to 40 feet of snow annually in the higher elevations, the snowmobile season extends usually from the beginning of December to the middle of April. Lander, Cody and the area near Togwotee Pass are the hubs of snowmobile activity in the forest. Numerous outfitters rent snowmobiles on a daily basis and can provide guided trips for those less experienced, and a number of motels also remain open during the winter to provide food and lodging. Snowmobile activity has increased in the forest with increased restrictions on their use within Yellowstone National Park. As a gateway to two entrances leading into Yellowstone National Park from the east, the forest has a number of scenic roadways. A federally designated All-American Road, the Beartooth Highway (U.S. Highway 212), weaves through the forest and serves as the northeastern entranceway to Yellowstone National Park. Immediately south of the Beartooth Highway, the Chief Joseph Scenic Byway (Wyoming route 296) follows the old trail in which Chief Joseph and the Nez Perce tribe attempted to flee the U.S. Cavalry in 1877. South of there, Buffalo Bill Cody Scenic Byway (US 14/16/20) heads west from Cody, Wyoming and crosses Sylvan Pass as it enters Yellowstone. Lastly, the Wyoming Centennial Scenic Byway (US 26/287) heads west from Dubois, Wyoming, over Togwotee Pass and enters Jackson Hole and Grand Teton National Park. The Chief Joseph, Buffalo Bill Cody and Wyoming Centennial byways have all been designated by the U.S. Government as National Scenic Byways.